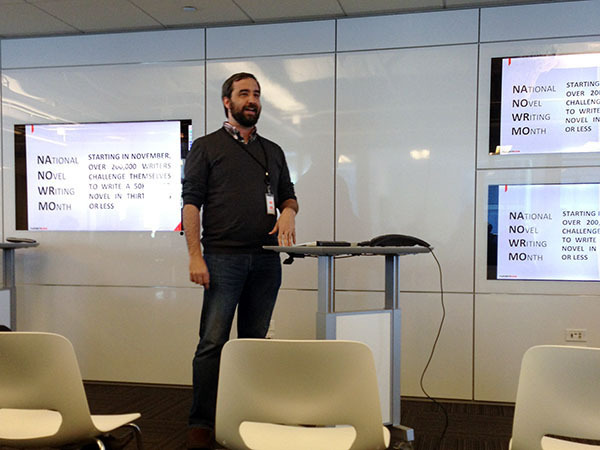 Isobar > The Squeeze >Archive>Lightning Talk: NaNoWriMo and YOU! Lightning Talk: NaNoWriMo and YOU! First things first, let’s get the pronunciation out of the way: ‘nan-o-REE-mo’, or alternatively ‘nan-o-RIE-mo’. Now that we have that out of the way… what is NaNoWriMo? As you can guess from the mixed-case spelling, NaNoWriMo is actually an acronym for ‘National Novel Writing Month.’ Each year, hundreds of thousands of aspiring and professional writers use the month of November to write a 50,000 word novel in 30 days or less. 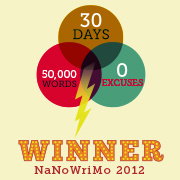 Yes, that’s right… FIFTY THOUSAND words in only 30 days. Sounds nuts, right? Well, not only is it very possible, I’m going to give some suggestions on making it as easy as possible. Before we talk about tips to completing your novel, we need to discuss some of the rules of the game. The novel you write must be at least 50,000 words, but it can be longer. Some writers during NaNoWriMo try to write 50,000 words on the first day; others try to write one MILLION words during the month. All of this qualifies as following this rule, as long as your novel has more than 50,000 words. Some examples of books around 50,000 words include Slaughterhouse Five and The Outsiders. By comparison, the Lord of the Rings Trilogy includes nearly 500,000 words, while War and Peace is nearly 600,000 words. Your novel can’t be an extension of work you’ve done in the past, or the finishing touches on a partial novel that already exists. It must be a completely original text, begun and finished within the month of November. It should be noted that character studies, outlines and general story ideas can be fleshed out before NaNoWriMo begins – however, anything written before November should not be used during November. To clarify, a novel is an original, fictional narrative. It isn’t a set of poems or short stories, or a non-fictional account of the migration patterns of Canadian Geese. Granted, I’m not saying you shouldn’t be writing these things – take every opportunity you can to write and create! However, in the case of NaNoWriMo, only original narratives should be included. NaNoWriMo is an exercise for one author at a time, challenging an individual to write a novel. While it is suggested that folks participating have support from others who are also writing novels (see the ‘Tips’ below), your writing is your own. If you’d like some feedback, or comments, or even help working out some issues, wait until December… November is for you to write on your own. See Rule #3… this should be obvious, but it needs to be mentioned. Rule #6: Upload the novel for word count verification no later than November 30th at 11:59:59pm Eastern. If you follow all of the rules listed above, you WIN!!! Granted, you don’t really ‘win’ anything, as there aren’t any prizes… but you can call yourself a winner! Of course, following the rules is just the beginning of competing in NaNoWriMo. There a certain number of Tips and Tricks that should be kept in mind while you are preparing to write, and as you continue through the NaNoWriMo process. For me, I had a good deal of time on the train during my commute. So, in the morning on the way to work and the evening on the way home, I would write my words for the day. For you, it may be at night before you go to bed; for others, it might be during their lunch break. Whatever the time of day that works for you, set it aside and dedicate it to writing for NaNoWriMo. Always keep writing. It doesn’t matter what you are writing, or how bad it is, or if it makes sense. Keep writing. Write every day. If you miss a day, try and make up the missed words over the next few days. If you miss two days, set some time aside and power through catching up. The fear with missing days is once a few days are missed, it becomes easier and easier to continue not writing. At some point, it just becomes easier to give up. Don’t give up. Even when it is a complete struggle… keep writing! Or, for that matter, any other word processing program which warns you of mistakes as you make them. During NaNoWriMo, you don’t need a computer telling you how many mistakes you are making. All of those red and blue underlines filling up your document can be highly distracting, beckoning you to go back and edit. See Tip #3 – don’t EDIT! The more you can do to keep the need to edit down to a minimum, the better. Use basic text editors, or something else that simply allows for typing. This is the most important tip, so I’m listing it twice. Don’t stop writing until you have reached your goals for the day. If you get blocked, work your way through it. There are a number of suggestions for how to get through a block, but one of the best is not to get into one in the first place. Teach yourself to stop writing when you are on a roll, or at a high point. If you stop when you are blocked, you will come back to your story at a point that is known to be difficult. That isn’t helpful at all. However, if you stop writing when you are on a roll, you remain excited about the ideas you are writing, as well as you look forward to getting back to it and finishing. Stop in the middle of a gunfight, or the middle of an argument, or the middle of a chase scene. Stop in the middle, leave yourself a cliffhanger to come back to, and writer’s block will have a much harder time rearing its head. Tell everyone you know you are writing a novel. Find others to write with you. Constantly challenge yourself to beat your friends. Create rivalries. Do whatever you can to build support for you finishing the task of writing a novel. You have to write the novel by yourself, but that doesn’t mean you can’t have your friends and family support your endeavor. The NaNoWriMo community is active year-round, so if you are interested in learning more, there are a plethora of resources available on the web. But, as the Summer ends and November gets closer, I’ll be thinking about NaNo, planning my next story, and active in the community more than ever. I’ll be writing a novel this November… will you?